November 11, 2017 March 28, 2019 Daniel Adeniji 3701, Local Temporary Table, Microsoft, Msg 3930, SQL Server, Table, Technical, Temporary Table, Transact SQL, XACT ABORT	Level 16, Msg 3930, State: 1, The current transaction cannot be committed and cannot support operations that write to the log file. Roll back the transaction. Reviewing some Transact SQL Code and saw a code block that works well in exception handling, but can have a bit of side effect in Transact SQL. When the temp table does not exist, an error is raised. Because the drop table is enclosed in a try/catch block the error is gracefully handled by the system. But, yet there is a bit of silent noises. message :- Cannot drop the table ‘#pollingData’, because it does not exist or you do not have permission. There are other errors that can be avoided with dropping an object only upon validation that it exists. If you use the set xact_abort on directive, your code will abort upon running into the error mentioned above. Msg 3930, Level 16, State 1 .. The current transaction cannot be committed and cannot support operations that write to the log file. Roll back the transaction. What datatype is the null value? A few weeks ago, I ran into a Transact SQL problem and I was forced to ask myself why two database objects were not compatible. In the rest of this post, I will share the “foundational” scenario and try to start answering the question, what datatype is Null. Our baseline scenario is to join data from two data-sources. In our case, data from two sources have being brought into our databases and are now available as two tables. Let us lay out our database objects. Let us create our two tables, datatype4null.person and datatype4null.organization. Let us insert data into our two tables. Insert data into the person table. Insert data into the organization table. As we will like to expose the data from our datasources as if they were from a single source, we will use a view to do so. Here is the view that uses a union to merge the data from our two tables. So everything is good, we are able to fetch from our union. But, what happens if we decide we will need to add a bit of logic and we will place some logic and thus use view instead of tables. Let us create views rather than tables. Let us query our new Union View; the one that query’s the “Views Union“. But, we get an error message. Conversion failed when converting the varchar value 'NBC News' to data type int. Our error is traced back to how SQL Server deduces and assigns datatypes to literal and computed columns. The value null is defined as as int. 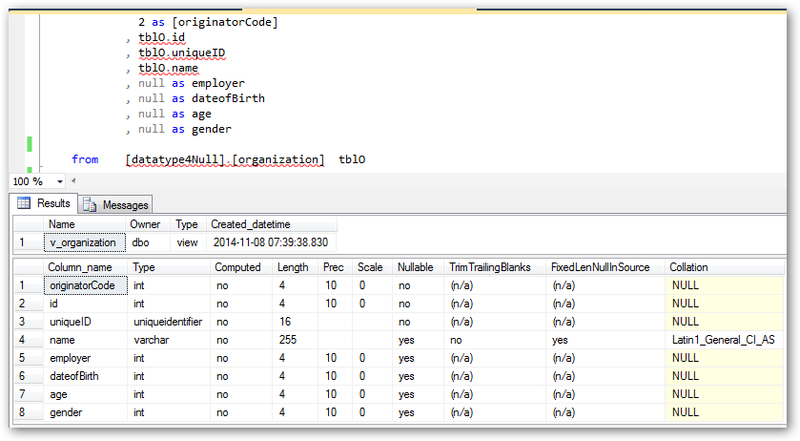 From the screen shot above, we can see that SQL Server assigns our null value the int data type. To fix, we will have to match our datatypes using cast or convert. Thanks to God for his Sabbath, my lazy Saturday. Finally got around to watching Robert Redford’s “Horse Whisperer“. The movie is almost done, but it is paused as I goggled for which songs goes “I was looking for a soft place to fall“. “A Soft Place To Fall” was written by Allison Moorer, Gwil Owen. I think Allison Moorer & Gwil Owen song’s lyrics makes for a good parting. Incidentally, Demaryius Thomas story on ESPN ( http://espn.go.com/espn/feature/story/_/id/11830457/denver-broncos-demaryius-thomas-dreams-reuniting-estranged-family ) ended up along the same line. “I’m making it my responsibility to give her a soft place to land,” he said. Now that we have taking care of one pallid error message, let us return to things that matter. 2013-01-03 01:22:28.12 spid59 Error: 17066, Severity: 16, State: 1. 2013-01-03 01:22:28.12 spid59 SQL Server Assertion: File: &lt;"cxrowset.cpp"&gt;, line=1538 Failed Assertion = 'pXacc-&gt;FHasVirtualColumn()'. This error may be timing-related. If the error persists after rerunning the statement, use DBCC CHECKDB to check the database for structural integrity, or restart the server to ensure in-memory data structures are not corrupted. 2013-01-03 01:22:28.12 spid59 Error: 3624, Severity: 20, State: 1. 2013-01-03 01:22:28.12 spid59 A system assertion check has failed. Check the SQL Server error log for details. Typically, an assertion failure is caused by a software bug or data corruption. To check for database corruption, consider running DBCC CHECKDB. If you agreed to send dumps to Microsoft during setup, a mini dump will be sent to Microsoft. An update might be available from Microsoft in the latest Service Pack or in a QFE from Technical Support. Yes, young one, this is not an easy one. But, anyways as you have friends on the .Net, you have come to the right place. If you take a quick look at our definition for partitionIDOrig, you will see it is hard-coded to be 0. Everything worked well when we were inserting into the table. But, once we changed to Merge, things broke. I think when Microsoft invokes FHasVirtualColumn(), they are asking whether we have Virtual columns — And, things “stumble” a bit when the calculated column is actually a hard-coded value. Note that the database server will try to and most like recover itself. But, in our case, the time for a successful recovery was too much and so we chose to ‘circumvent’ possible recovery by renaming the database log files. 2010-09-27 22:34:28.48 spid24s     Error: 17207, Severity: 16, State: 1. 2010-09-27 22:34:28.48 spid24s     FileMgr::StartLogFiles: Operating system error 2(The system cannot find the file specified.) occurred while creating or opening file 'E:\MSSQL\datafiles\DEMO\logfiles\Demo_LogFile.ldf'. Diagnose and correct the operating system error, and retry the operation. 2010-09-27 22:34:28.48 spid24s     File activation failure. The physical file name "E:\MSSQL\datafiles\DEMO\logfiles\Demo_LogFile.ldf" may be incorrect. 2010-09-27 22:34:28.48 spid24s     FileMgr::StartLogFiles: Operating system error 2(The system cannot find the file specified.) occurred while creating or opening file 'E:\MSSQL\datafiles\DEMO\logfiles\Demo_SecondaryLogFile.ldf'. Diagnose and correct the operating system error, and retry the operation. 2010-09-27 22:34:28.48 spid24s     File activation failure. The physical file name "E:\MSSQL\datafiles\DEMO\logfiles\Demo_SecondaryLogFile.ldf" may be incorrect. 2010-09-27 23:20:26.75 spid24s     The log cannot be rebuilt because the database was not cleanly shut down. Attaching DB Without .ldf file ?? ?